17 January, New York City–A new podcast, launched today on Apple Podcasts, brings listeners compelling stories of people who are tackling urgent global issues including extreme poverty and climate change and creating sustainable growth that doesn’t steal from future generations. 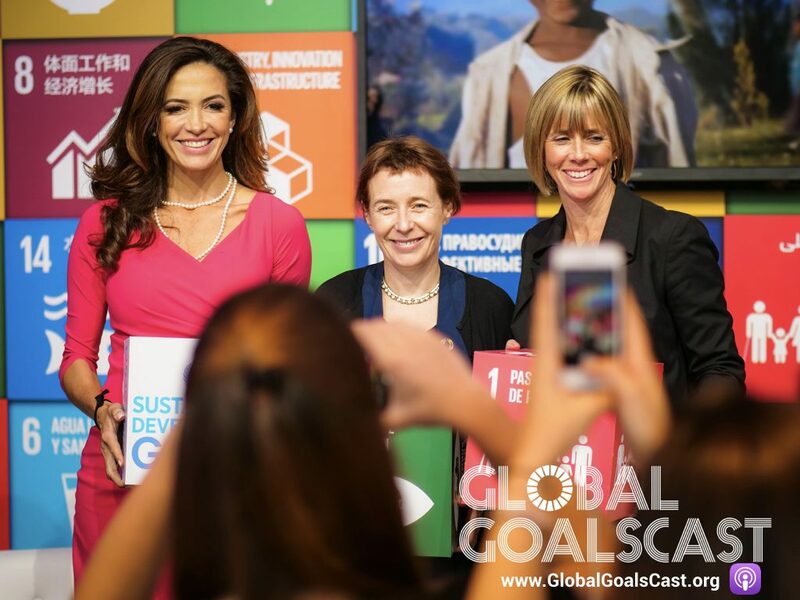 Co-hosted by Claudia Romo Edelman and Edie Lush, Global GoalsCast focuses on the 17 Sustainable Development Goals – also known as the Global Goals. Signed by 193 countries in 2015, the Goals have specific targets to achieve a more prosperous, peaceful and sustainable world by the year 2030. The mission of the podcast is to mobilize a global audience of millennials to learn about the Global Goals, get involved and shape their own futures. Achieving the 17 Global Goals will require greater collaboration and cooperation than any previous effort in history. Global GoalsCast is the first podcast to take on the challenge of tracking the entire effort. For example, a premiere episode on education (Jan. 17) features Jeanette Monosoff-Haley, a Mumbai-based organizer working to support the education of some of the poorest children in India. Her efforts focus on small steps, like finding textbooks, uniforms and even a girls toilet. Development experts have identified keeping girls in school as a top priority. “Improving access to education may be the single most powerful step the world can take to improve not only girls’ lives but the lives of their families and the economies of countries. The UN has called education the key the foundation to other goals like health, prosperity – and even tolerance and peace,” says Lush, executive editor of Hub Culture and a prominent business journalist and communications coach. Another episode, “Journey Across Antarctica: The Swans and Climate Change,” (Jan. 21) profiles the father-and-son explorer team of Robert and Barney Swan, who embarked on a 600-mile, eight-week expedition to the South Pole using only renewable energy. Additional episodes include audio from Will.i.am, Malala, William Lacy, Louise Arbor, and President Obama. The podcast will also introduce listeners to new, authentic voices such as Dali (16) and Fin (14), from the clothing company Nalu, who are creating alternative ways to provide education access to all. Listeners will also meet Brenda, who got an internship and then a job with Google when she was a student but might have to leave the country because of her legal status. Both Lush and Romo Edelman trained as journalists and Global GoalsCast strives to adhere to journalistic standards of accuracy, fairness and transparency. The podcast is an initiative from the We are all Human Foundation, which is dedicated to promoting diversity, radical inclusion and equity. For inquiries, please contact press@weareallhuman.org. Created for a global audience, Global GoalsCast serves listeners looking to be moved by the actions of other and, enlightened by the progress updates towards achieving the Sustainable Development Goals Each episode offers listeners inspirational stories around the progress towards achieving the SDGs, high quality data, and numerous ways in which they can take action and personally contribute to progressive global efforts. Hosted by Claudia Romo Edelman and Edie Lush, Global GoalsCast will be available for subscription at Apple Podcasts or wherever you get your podcasts from.